After experiencing several very public corporate scandals over the past decade, the U.S. has now moved to a more regulated way of doing business, and the code of conduct has emerged as one of the mechanisms for defining employee and corporate behavior that adheres to regulatory and industry standards. However, a code of conduct is much more than a set of rules, requirements, and prohibitions. Its true significance lies in its capacity to serve as a living document that embodies your company’s core values and commitment to ethical practices. 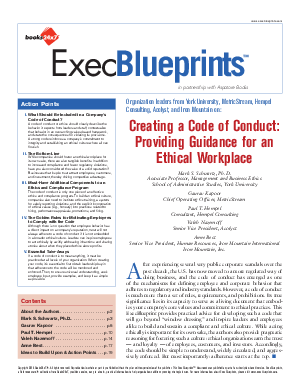 This ExecBlueprint provides practical advice for developing such a code that will go beyond “window dressing” and inspire leaders and employees alike to build and sustain a compliant and ethical culture. While acting ethically is important for its own sake, the authors also provide pragmatic reasoning for fostering such a culture: ethical organizations earn the trust — and loyalty — of employees, customers, and investors. Accordingly, the code should be simple to understand, widely circulated, and aggressively enforced. But most importantly: adherence starts at the top.